Now I can't remember if I picked this magnet up, or if someone brought it home for me. Hmmm. Either way, I totally dig it, because it reminds me of the beginning of Doctor Who's Turn Left episode, where the DoctorDonna are wandering through an Asian market, trying out the local wares, including a tall cup of foamy drink...that of course got cut out in the US/BBC-A version. Oddly, now that I've gone back to look at that episode, it looks like even that first minute isn't really all that much like this magnet, it's more like it reminds me of the last spine-chilling minute of that episode, instead. Still, this feels like a pretty accurate picture of Hong Kong - a thousand neon lights, amidst a thousand tall buildings, and a trillion people. It's quite the place to visit, even if only for 15 hours. I can't even think about it must be to like know what all those signs say - like "Joe's Pub"? "Manicures here" *blink* blink* blink* "Buy one, get one free? BOGO?" "Chinese laundry"? But what's that LA BAMBA over there mean? Hahahaah. I suppose it's probably akin to seeing all the signs in Times Square. 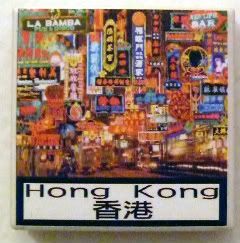 TSQ really has nothing on the lights and signs of Hong Kong, and ours are only concentrated within that 20 block radius, from 41st Street all the way up to about 53th Street. And it's mostly corporate logos, rather than individual stores and establishments in HK. Honestly, it seemed like every street corner we turned down, there were streets and alleys that were lit up - I'd bet you can see it from space! Very cool magnet, for a very cool town.